This blog by Chris Moore is the second in a series of blog posts about people with access needs. The aim of the series is to raise awareness of the different ways people access websites, the common issues faced and what designers and developers can do to remove the barriers. Chris Moore, Digital Accessibility Champion and particular needs IT user spoke to us about the problems he faces, and his solutions. Most importantly, he answers the question - how can we make the web more accessible? 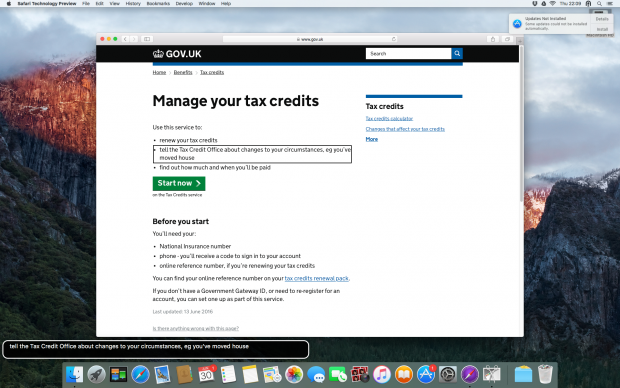 I currently work in HMRC as their Digital Accessibility Champion. Before this role, I was a content designer for tax credits. Other roles include web design, project management and equal opportunities officer. I was born with glaucoma and became partially sighted in my teens, then I rapidly achieved complete blindness in 2010. I also have profound mixed hearing loss and was fitted with Bone Anchored Hearing Aids (BAHA) in 2009. Being both deaf and blind certainly brings challenges, especially with getting around. My type of hearing loss makes it difficult to determine which direction sound is coming from, which is essential for orientation when you can’t see. If it is windy outside, the only thing I can hear is air being blown into the microphones. When inside, I prefer to be in quieter environments and tend to sit where there is a wall behind me to cut down background noise, as it over shadows the things I need to hear. 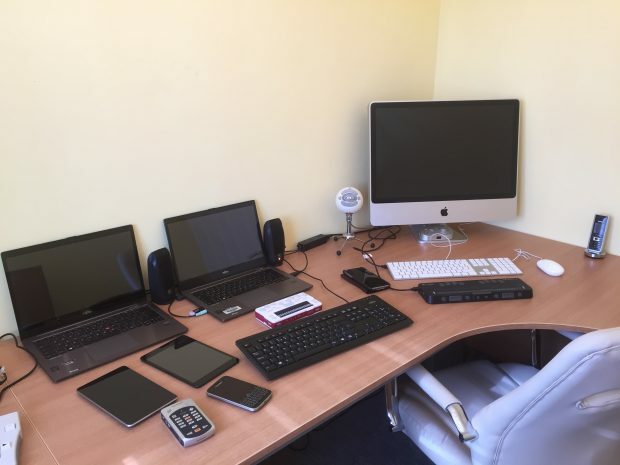 I use various devices including Windows, Macs, iPhone and iPad and even Android. On these devices I use a range of screen readers like JAWS (Job Access With Speech), NVDA (Non Visual Desktop Access) and VoiceOver, to check the accessibility of our services. Using a screen reader, users can navigate by heading, ARIA landmarks, links, tables and other structural semantic elements. When working in the office, I feed the sound output from the screen reader directly into my BAHA either by audio cable or Bluetooth so I don’t disturb anyone else. My primary screen reader at work is JAWS, as this is the most productive way to use Microsoft Office. However, when using Google services or social media, my weapon of choice is VoiceOver on the iPhone. On my desk I have a standard VoIP phone which I am unable to directly use. This is because I can’t see the screen and the handset is not quite loud enough. I get around this by diverting my calls to my iPhone, which has a louder and clearer earpiece. In addition, VoiceOver announces who is calling. As a backup, I also have a work Blackberry, which includes a very basic screen reader. I guess as a screen reader user I am quite unusual, as I prefer to use a Mac and VoiceOver instead of JAWS and Windows. JAWS is the most popular screen reader, but VoiceOver was the first one I encountered when I lost the ability to read text on screen. As my main computer back then was a Mac, and I had recently bought an iPhone, I thought that I would have to switch to something more blind-friendly. Fortunately though, I discovered that VoiceOver is built directly into all Apple devices. This was really convenient as this meant I did not have to purchase or download anything to enable me to get back up and running. While using Apple devices, I use the Safari web browser, as it is the only browser optimised to work with VoiceOver. Safari also has a great little reader mode that enables you to focus on the text by hiding all the ads and clutter. The other great thing about VoiceOver on the Mac is that visually it is more interesting to look at when I demonstrate how a screen reader works. This is because it clearly indicates where the VoiceOver cursor is on screen and you can display a caption of what is being read out. I find that a lot of web pages don’t use the correct heading order. Headings help me get a sense of the structure of the page. If the web page also includes navigation landmarks, it further enhances the experience by giving me a greater sense of the page layout. Some of the other barriers I face are unlabelled form elements or items that can’t be reached without a mouse. It is very frustrating when you start a transaction like online shopping and you are not sure what needs to be entered into a form field or you are unable to activate the button to checkout. Situations like that force me to close the window and then find a more accessible competitor, which then results in me giving my money to that business instead. As a minimum, they should test their web page with a keyboard and confirm that they can tab through all links and form elements (including buttons). Ideally though, learn to use a screen reader or get an experienced screen reader user to test on your behalf. Make sure you test with the types of screen readers people actually use like JAWS, NVDA or VoiceOver. Content designers need to ensure that links make sense when read out of context and that context is provided for ambiguous links and buttons. Developers need to check that all form labels, hints and errors are associated with their input field, and to remember to group radio buttons and checkboxes by using a fieldset and legend. Tables must have the correct tags for header and data cells, so I can understand and navigate them. It is also important to remember when using HTML 5 and ARIA amongst the screen reading community, the most common screen reader and browser combination is JAWS and Internet Explorer. The problem with this setup is that Internet Explorer is quite old and doesn’t offer the same level of support for HTML 5 and ARIA compared to modern web browsers like Firefox or Chrome. So check your code works with older browsers too. HI Chris, when do you think the results of the Assistive Technology survey (undertaken by GDS earlier this year to assess what AT service users use to access Gov.UK) will be published? We're keen to learn more about the outcomes.